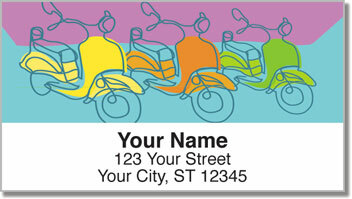 The trend of trading in gas-guzzling vehicles for more efficient motorbikes inspired this colorfully creative set of return address labels. These days, you'll see all sorts of people zipping around on mopeds and motorized scooters. Sometimes it's for entertainment and sometimes it's for convenience - but either way - it's always a good time! 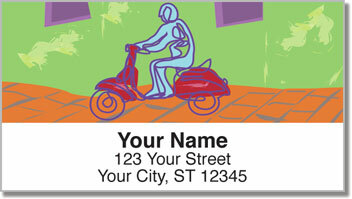 Motor Scooter Address Labels from CheckAdvantage celebrate your new favorite activity while saving you a ton of time at home. No more scribbling out your name and address by hand! A convenient self-adhesive backing means all you have to do is peel and stick them on every envelope! 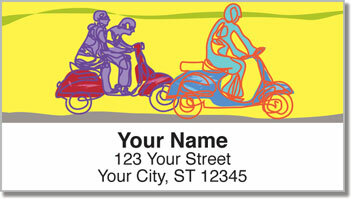 Get your own Motor Scooter Address Labels today! 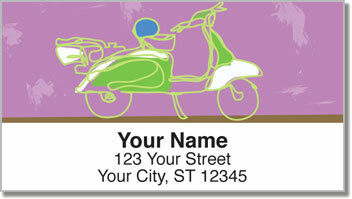 You can also order this design as a set of matching personal checks.